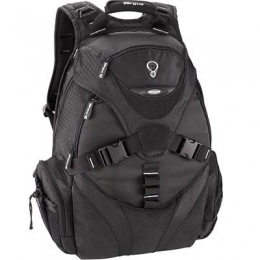 Maximum Screen Size Support: 17"
The Targus Voyager Backpack is designed to fit notebooks with up to 17" screens and is perfect for those who travel with a number of mobile accessories. This backpack includes a large insulated compartment and two water bottle pockets, ideal for food and beverage storage. The zip-down workstation features an ID holder, pen loops, CD/DVD storage, removable key fob and an accessory pouch. The large main storage section has plenty of room for books and files. The CD/MP3 player pocket with line-out porthole for headphones is a convenient place to store your media while on the go.